The best reminder to keep on dreaming, and make sure your dreams are big ones!MATERIAL: Gold platedThis beautiful Wishing bracelets collection from Joma Jewellery is the most thoughtful gift. Each gorgeous bracelet sits on a magical opening wishing card - perfect for writing your own special message inside. 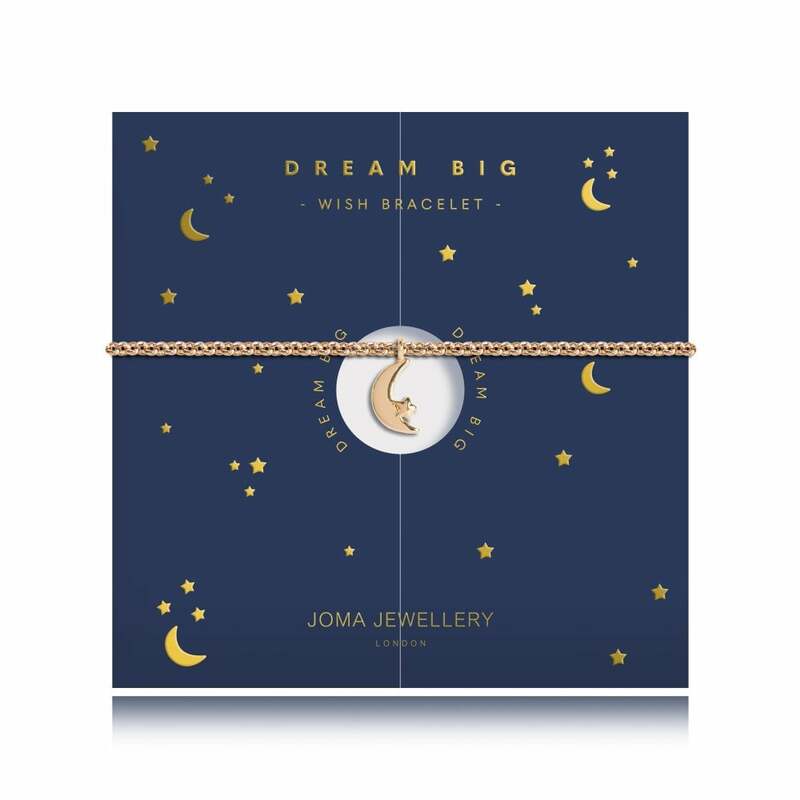 This sweet Dream Big Wishing bracelet from Joma Jewellery is the perfect way to keep hold of all of your dreams! This delicate gold plated bracelet is finished with a crescent moon charm, with a tiny little heart placed on top of it. Whether given as a gift or worn by yourself, this bracelet will give you the motivation to achieve your dreams!The bracelet is presented on a gorgeous navy blue care with opening windows, a feature allowing you to write your own special message inside!Please keep your item dry at all times and away from perfume and body creams in order to preserve any plating and to ensure your piece lives a long and beautiful life.SIZE: Adult size bracelet. 19cm with adjustable options.